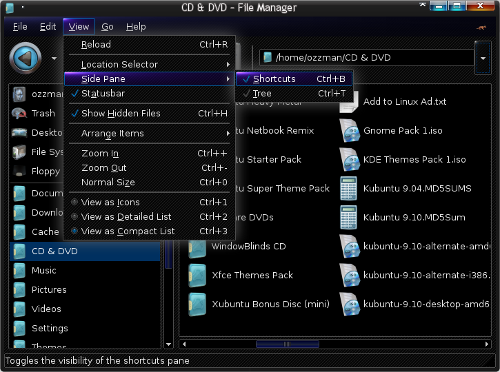 Thunar is the default file manager for Xubuntu‘s Xfce desktop environment, and is as stable in Ubuntu as the default app, Nautilus (especially since Xfce uses a lot from Gnome anyway). In many ways, you can’t tell the two programs apart, but for a time Thunar was way ahead of Gnome‘s file manager. That’s not just because of advanced features like custom actions you could add, but because of the various views you could have. For example, for newbies tentatively moving away from Windows, the Tree view in the side pane is assuringly similar to Windows Explorer. While Nautilus has certainly caught up, with being able to add to context menus via actions, and 6 different views for the side pane, Thunar is still worth installing because you can get the best of both worlds. You can leave Nautilus with the Places pane on the left and “Icon View” (thumbnails) on the right, and for when you want to browse via a Tree pane with “Compact List” icons (“List View” in Windows Explorer), you can open Thunar. Also, unlike with Nautilus, you can still access the defined shortcuts (usually available via the left pane) while in Tree view by clicking a button at the end of the address bar. If you are thinking Thunar might be good to have as a backup in case Nautilus is having problems (which it is), but prefer it to look like Nautilus, then you can always change things back to how you like them (change the Tree pane to Shortcuts). If you like this idea, but are thinking the icons in “Compact List” view are too small, you can always make them bigger (seen above), via the View menu, or zoom with your scroll wheel. If you look at the pics, you’ll see some minor differences between the two file managers. Firstly, while Thunar uses the same icons for toolbar buttons that Nautilus does (they both get them from the current icon theme), Thunar‘s are bigger (which I personally like). You’ll also note from the second pic that in your home folder (and elsewhere), hidden folders and files are listed first. Other things worth mentioning are the differences between thumbnails and folder settings between the two, and that the Thunar context (right-click) menu will probably have less entries than you’re used to (though you should get “Open Terminal Here“ by default, while with Nautilus you have to install a package to get “Open in Terminal“). Lastly, since the Information pane in Nautilus is rather useless right now when it comes to info, you can use Thunar to get more info at a glance than Nautilus can offer. For example, when you’re in your ~/Pictures folder and what to know the size in pixels of certain images, you generally need to right-click each file and view the info via Properties > Image. But with Thunar, all you have to do is click each file and look at the bottom to the info displayed on the status bar (which can be enabled via the View menu if it is missing). So you could even do what I did: set up Thunar to display over-sized icons in “Icons” view, and then create a panel launcher to have your ~/Pictures folder open in Thunar (the command for such a launcher would be: thunar /home/yourusername/Pictures). That way, you don’t have to mess with icon size in Nautilus, but still get really large thumbnails of all your pictures, as well as info on dimensions presented in the status bar. To get more info about the plugins, simply paste their names (individually) into the Quick search field in Synaptic. The default “view” in both Nautilus and Thunar file managers is the “Icon“ or thumbnail view, which you can of course change if ever you want via the View menu. If you’re happy with thumbnails, but they’re too big for your liking, or you actually want to make them larger, like in your ~/Pictures folder, hold the Ctrl button while you zoom in or out with your mouse scroll wheel. In Nautilus (the default file manager in Ubuntu), you can make the thumbnails of pics rather huge, like only 2 fitting in each row, and the icons for any folders in there won’t be too large. On top of that, the change will only be recorded in the folder you’re in, so you can have most of your folders displaying thumbnails at the default size, have a few where the thumbnails are quite small, and then have huge thumbnails for folders like ~/Pictures. In Thunar (Xubuntu‘s default file manager), you can only go so big, and in your ~/Pictures folder the icons for any folders in there might actually look bigger than the thumbnails for pics; also, do that to one folder, and it is a global change (ie: it happens to the rest).